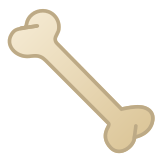 🦴 Bone Emoji was approved as part of Unicode 11.0 standard in 2018 with a U+1F9B4 codepoint, and currently is listed in 👍 People & Body category. You may click images above to enlarge them and better understand Bone Emoji meaning. Sometimes these pictures are ambiguous and you can see something else on them ;-). 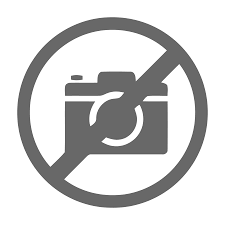 Use symbol 🦴 to copy and paste Bone Emoji or &#129460; code for HTML. This emoji has no gender or skin tone variations. 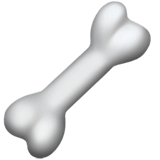 Bone Emoji is a pretty new emoji and it's support may be limited on older devices. You can get similar and related emoji at the bottom of this page.